12 September 490 BC There was the famous battle of Marathon. The army of Persian King Darius, the berths on boats to the coast of Attica, near the village of Marathon, had intended to seize Athens. The Greeks turned for help to Sparta, and with 10-thousand army under the command of Archon Callimachus made to meet the enemy. The Spartans were late because they were engaged in worship. 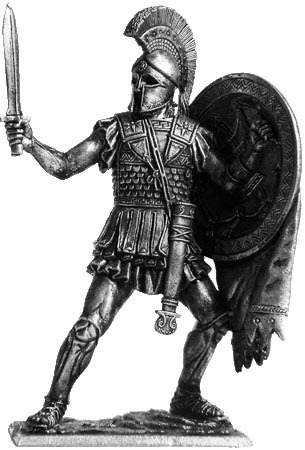 Greek army was 9,000 Athenian hoplites and 600 Plataea. To guide the army was nominated one of the ten strategists - Miltiades. He built a phalanx, maximum stretching its operation on the front and reducing the number of rows of the center. In this case, both flanks rested on the mountain slopes and further amplified by the best hoplites and light-infantry. On the approach of the Persians, the phalanx of jogging moved toward them to quickly overcome space, shooting the Persian archers. Infantry and cavalry, the Persians broke through the center of the Greek system, but the strong wings of the phalanx took ticks most battle-worthy part of the Persian army. The idea of Miltiades was justified, the Persians fled. Persian losses were 6400 people killed, the others managed to sink their ships and leave in the sea. At the Athenians were killed 192 hoplites, among whom was archon Callimachus. Hoplites outfit consists of a bronze Corinthian helmet with a hair comb, fenced on the sides of the bronze plates. Carapace (linotoraks) strengthened bronze scales through the torso. On the feet Leggings (knemidy) and leather sandals. Double-edged sword scabbard fitted with the mouth and the tip of the ivory. Shield goplon decorated with images of black marathon bull, a symbol of hoplites veterans. The lower part of the shield is attached leather apron, curtain, protecting feet from the arrows, darts and throwing stones. From the battlefield to Athens had been sent a messenger with news of victory. As soon as she reach to the city and telling the good news, he collapsed dead from exhaustion. In honor of the courageous hero of the Athenians began to hold competitions in the running for "marathon" that is equal to 42 km 195 m.